Stuck inside for the third or fourth straight day due to this crazy winter season? Your sanity may be getting a good wear and tear, and so has your flooring!! From salt stains on your carpet to muddy boot tracks on your hardwood, we are here to help solve all of your flooring stain problems! You knew at the beginning of the winter season what was going to happen…. muddy boot and salt tracks in your entryway. Instead of endless tiring scrubbing, make this years carpet clean-up easy with our full selection of carpet cleaners. Find everything you need to successfully clean your synthetic, cotton, sisal and even fragile wool entry carpets! Carpet Aid + works great on spot carpet cleaning! Browse ALL Of our Carpet Cleaners to find a cleaner that works for you! Get those pesky red tinted stains out of carpet and fabric with this Red-Out Spot Remover from Nilodor. Multi-Surface Stain Removal kit from Mostenbocker’s allows you to remove all types of pesky stains! Check out our FULL selection of stain removers! Finally, for those stains and smells from winter sickness (go away flu!) 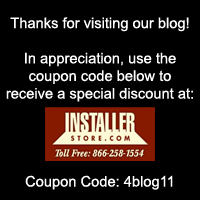 nothing gets the stink out like Installerstore‘s Odor Eating products! Ready-to-use Tech Skunk-X will remove (not cover up) skunk, pet, smoke smells and more!! Deodorize multiple surfaces with Odor Exploder from Host. Make sure to check out our full line of door and entry mats! Commercial grade to just plain funny, we have everything you need to protect your floors next winter! Commercial Grade Half Moon Crest mat is fabric and rubber based making it durable for indoor and outdoor use. This fabric and rubber Crest-Ridge mat are made of absorbent polypropylene and rubber gripper backing, which prevents falls. View ALL of our entrance mats and humorous welcome mats! Only 47 days, 4 hours and 10 minutes until Spring!